Keeping track of the days is sometimes difficult. Time can fly by and have us questioning what day, week, or even month it is. We have calendars on our phones, hang up paper versions around our offices and homes, and even set up alerts to remind us of when we are in the day. Even with all of that, we still get confused about dates and times. 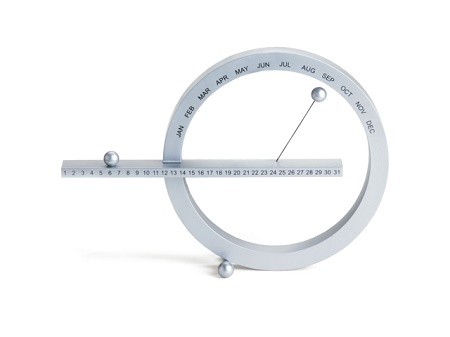 If you wish your calendar was more than just factual information, then you’re going to love the MoMA Perpetual Calendar. This is something that you have to interact with, so it won’t be as easy to forget what day it is. This was originally designed by Gideon Dagan for the Museum of Modern Art, but has been reproduced in a smaller version for the masses to purchase. This is a combination of circles and lines that will show you the date and month. The year isn’t defined, so it’s not something you’ll have to replace every time the first of January rolls around. Changing the date is a snap, as the spheres are held in place by magnets. This means you won’t have to worry about a metal ball disappearing every other day. This is a $36 purchase that would be a classy addition to any home or office. This calender is only 8”, meaning it won’t take up a ton of space, and will give you something to do when there’s nothing else to take up your time.